ACOUSTIC EXPO 2013: Truly great songs sound immense whether you play them with a full band on a massive stage with wind machines cranked up and the dry ice flowing, or in a tiny venue during a stripped back acoustic-centered set. Takamine, who are exhibiting at Acoustic Expo 2013, have an exclusive little spot in London called the Artist Showroom. 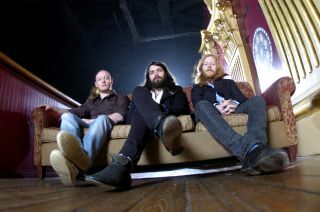 Showcasing his Takamine Pro Series P7DC, Biffy Clyro frontman Simon Neil took along bassist James Johnston and drummer Ben Johnston to perform a mini set of stripped back Biffy songs. Here we round up all three of their songs performed at the Takamine Artist Showroom. For more information on Takamine, please visit their virtual booth.